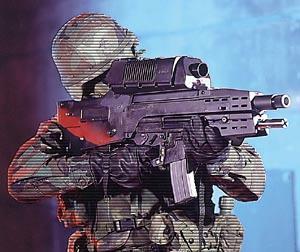 The weapon is a variant of the HK G36K, with an M16 magazine adapter. It uses 5.56x45mm NATO ammunition and three types of 20mm grenades, Bursting Munition, High Explosive and Target Practice. The on screen weapon display will change to reflect whether NATO rounds or grenades are switched. Carried by Ghost Recon Specialist Will Jacobs. This weapon is currently undergoing development and testing by HK and is not currently in active use. A possible date for infantry use may be around 2006. The weapon itself will retail around $15,000. One of the technical aspects being looked at by HK is the weight of the weapon, which currently is thought to be around 20 pounds, in comparison to an 8 pound M16.